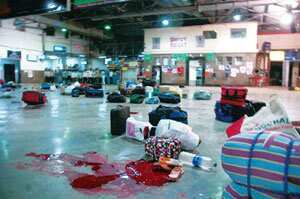 Islamabad: A Pakistani court indicted seven Pakistani suspects on terror charges on Wednesday in connection with last year’s attack on Mumbai, a defence lawyer said. Pakistani security agencies have also detained a former army major for possible links with two men arrested in Chicago on terrorism charges, an army spokesman said. According to US court documents, the Chicago pair discussed a planned attack on a Danish newspaper with members of the banned Pakistan-based group Lashkar-e-Taiba (LeT), which has been blamed for the Mumbai attack a year ago, in which 166 people were killed. Pakistan is under pressure from both India, which wants it to crack down on militants operating in Kashmir, and from the US, which wants it to root out Taliban fighters to help put down an insurgency in neighbouring Afghanistan. A lawyer for one of the seven men charged with taking part in the Mumbai attack said they had pleaded not guilty. They are allegedly linked to LeT. “The statements recorded and the evidence produced against the accused are contradictory to the charges," lawyer Shahbaz Rajput told Reuters. India has refused to resume peace talks with Pakistan and sought to bring international pressure on Islamabad to act against militants operating from its soil, including LeT. Washington wants relations between the uneasy, nuclear-armed neighbours to improve so its crucial ally Pakistan can focus on fighting Taliban militants, as well as helping in the war in Afghanistan. LeT is not believed to have carried out attacks inside Pakistan but its presence may still worry the government, which wants to demonstrate it is in control despite a battle against militants on several fronts. It has a large network of support among Pakistanis around the world, raising fears it could attack Western targets. Last month, David Headley and Tahawwur Hussain Rana were arrested in Chicago and accused of planning an attack on a Danish newspaper which ran cartoons of the Prophet Mohammad in 2005, sparking protests by Muslims in several countries. Rana is a Pakistan-born Canadian citizen while Headley is an American citizen who had spent time in Pakistan. Pakistani military spokesman Major-General Athar Abbas said a former army major was detained in connection with the case. “He’s still in detention and is being questioned," he said. LeT talked to the pair about about possible attacks in India, which it said should be given priority over the alleged Denmark plot, court documents said. LeT has denied links with the Chicago arrests. Once nurtured by Pakistan’s powerful Inter-Services Intelligence (ISI) spy agency to fight India in Kashmir, Lashkar shares al Qaeda’s concept of global jihad, or holy war. Pakistani authorities officially banned Lashkar after it was blamed for a 2001 attack on the Indian parliament but analysts say it is tolerated unofficially. Authorities also briefly put Lashkar’s founder, Hafiz Mohammad Saeed, under house arrest and closed the offices of Jamaat-ud-Dawa (JuD), a charity he headed, after the United Nations said it was a new alias for LeT and put it on a terrorist list in 2008. But JuD has apparently re-emerged under another name and its cadres were involved in relief activities for those displaced by an army offensive against the Taliban in Pakistan’s Swat valley in May.